Want to propose a talk? Volunteer for the event? Help us spread the word? Or just have an idea to share? You can always reach us on Twitter, LinkedIn, and Facebook. But if you’ve got something in mind, use the form below. Tell us a bit about yourself, and how we can help. We won’t share this information with others, or use it in bad ways. If you’re suggesting someone else, we hope you’re able to connect us to them somehow. A warm introduction is always better. We try hard to bring speakers from around the world to Ottawa each year, so we definitely favor international speakers with practical experience in government innovation. If you’re a vendor with a product to pitch, it may be better for you to sponsor the event. We work hard to produce an event with a diverse roster of speakers and an audience from all walks of society. Please keep this in mind as you’re thinking of speakers who might be a fit. Our Call for Proposals is now closed. We received nearly 200 amazing talks for the 2018 event. If you'd like to speak at an upcoming conference, you can follow us online or sign up for our newsletter to get notified about future conferences. Thanks for considering helping us to put on FWD50. We don’t receive any government grants, so we depend entirely on ticket sales and sponsorship. This lets us remain independent and transparent—but it also means we need the support of like-minded organizations from the private sector who know that a rising digital tide lifts all boats, and recognize the need for great conversations around digital policy in the modern era. One other note: FWD50 is a content-focused event. There’s no “expo hall” at the event; some sponsorships include a speaking or interview opportunity within the lineup, so we work closely with sponsors to ensure that the content is valuable and fits within the goals and topics of the conference. What website should we visit to learn about you? What content would you like to cover? You don't have to decide now, but it would help to know what topics, departments, technologies and challenges you're interested in speaking about. 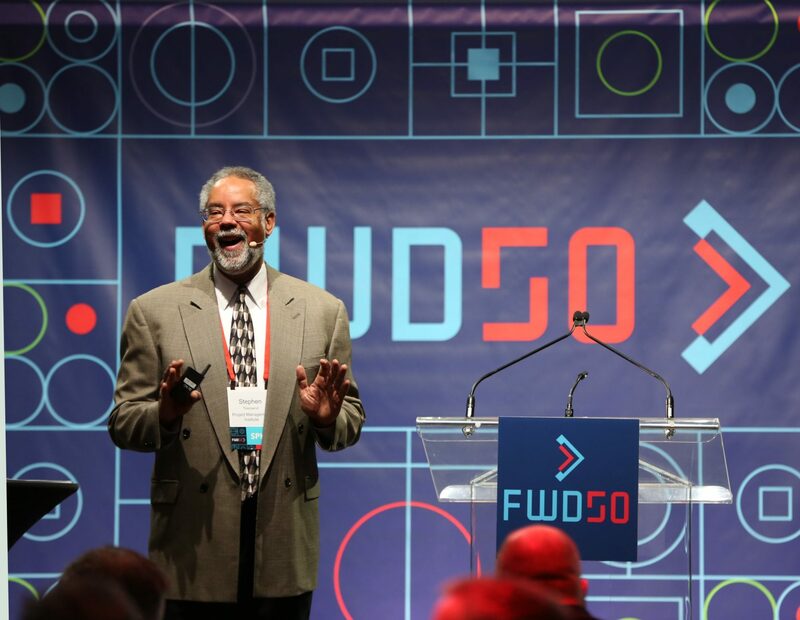 FWD50 is a “big tent” event—we want many voices involved. We believe strongly in the idea of “more wood behind fewer arrows,” rather than splintering the digital government conversation. Each year, we bring together like-minded organizations from Canada and around the world. We’ve worked with organizations including DPI, Policy Ignite, Code for Canada, and others to include them in the lineup, giving them a voice, facilities, and access to our faculty. Let us know about you and how you’d like to coordinate with us. What site can we visit to learn more about you? Thanks for offering to help out! Volunteering is a great way to attend the event and work side-by-side with our international faculty. In keeping with our accessibility goals, we prefer volunteers who otherwise wouldn’t be able to attend: Students, academics, and so on. If you’re a volunteer, we expect you to dedicate at least eight (8) hours of your time onsite. What school or organization do you work with? Which of these skills do you have? Do you have any mobility restrictions that would make you unable you to do tasks such as folding/moving chairs, carrying/filling water suppliers, etc.? Although we cannot guarantee your role, please select all that apply to you from the list below, and we will try our best to accommodate your preferences. No preferences. Good with whatever! How do you prefer to breakdown your volunteer shift? What shirt size do you wear? Anything else we should know about you as a volunteer? We offer deep discounts for groups of 5 or more. We also have deep discounts to groups of government employees from the same department that include not only the keynotes and breakouts in the general conference, but also access to workshops on November 7. Is this for a government department? Is the organization buying these tickets part of a federal, state, provincial, or municipal government? What government department do you work with? What else should we know about your group? Making sure everyone can participate in the event is important to us. We offer discounted tickets for a variety of groups, and for organizations who want to send several of their members. Are you part of a nonprofit, NGO, or academic institution? Why do you want to participate in FWD50? Is this your field of study? Are you part of a cause, or do you have a specific topic you care about? What else should we know about your discount request? Thanks for offering to help get the word out about FWD50. There are many ways you can make sure as many people as possible know about the event. Do you have contacts in media? Can you spread the world on social platforms? Is there an organization you think we should partner with? Any other ideas about promoting the event? We have some media resources—logos, badges, and codes—we'd like to share with you. We’re thrilled at the number of media organizations that want to cover the conference. We offer free access to accredited members of the press, provided that you cover the conference in an approved publication, online or off, within five (5) days of the event taking place. We take your coverage plans into account when granting media passes. Social media, photo compilations, and articles not related to digital government are not considered press coverage. We generally grant one media pass per news outlet. What media outlet do you create content for? What are 3 examples of articles, posts, videos or podcasts you've published in the past six months? If you don’t have past articles, can you provide us with a letter from your assigning editor or producer, on company letterhead, outlining the coverage you intend to produce? What topics do you intend to cover at the event? Are there any speakers you'd like to interview beforehand? What else should we know about your media coverage? Got a request that doesn’t quite fit one of the above categories? Let us know how we can help. In a sentence, what's this about? Please provide as many details as possible so we can make sure the right person on our team gets back to you. By when do you need an answer?